The Atlassian Team Calendars team is pleased to announce the release of Team Calendars 1.9. This release enables you to easily apply any JIRA saved filter to a JIRA calendar. This particular release is targeted towards project teams looking for flexible JIRA reporting as well as IT teams using JIRA for Change Management. 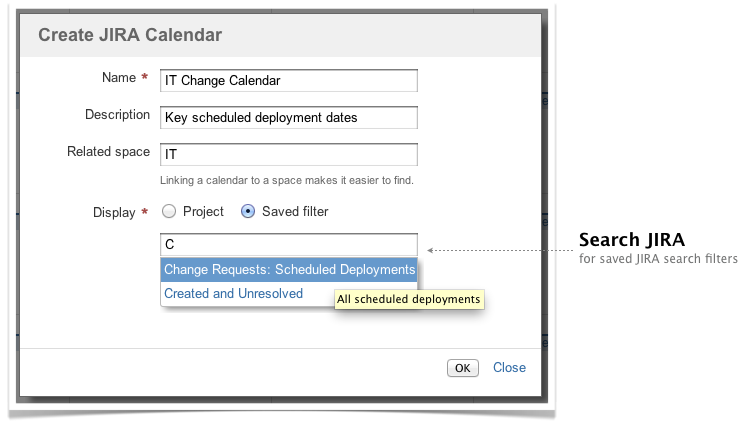 This release helps IT teams communicate system change, schedule deployments and quickly identify "what changed and when". Putting a change calendar alongside a team leave, travel or roster calendar makes team resource planning just that little bit easier so you can quickly see what changes you have due and how the availability of your team could impact your project. Alternatively, download the latest release from our plugin exchange and install it via the Plugin Administration screen. This should upgrade Team Calendars to 1.9.0. Alternatively, download the latest release from our plugin exchange and install it via the Plugin Administration screen. This should upgrade Team Calendars for JIRA to 1.0.4.